jBixbe visualizes classes and objects with their attributes and relationships in structure diagrams. 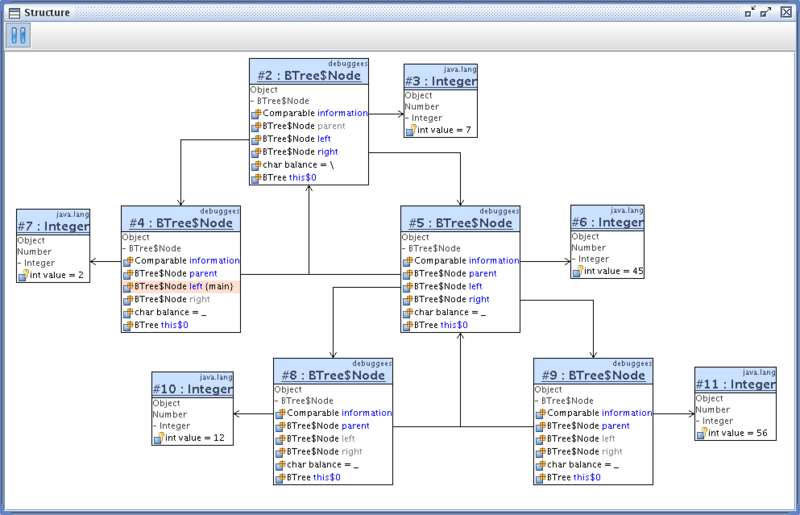 Structure diagrams allow a free arrangement of objects. They can be added by Drag & Drop or by clicking on an object reference. Therefore the debugger is an excellent choice for analyzing data structures. In a structure diagram you can get a quick view if lists are linked in the right way, trees are balanced correctly and entries are successfully inserted. At the same time you can observe operations executed on these data structures in a sequence diagram.